Unlike appliances that fit like a bulky mouthpiece, FX Fangs are thin vaneers that fit over the front of your teeth so that when you speak, your speech remains natural. 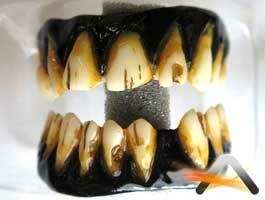 Fx Fangs are designed and created with an ultra-high level of quality and hyper realistic detail surpassed by no one. Our teeth look real. Because of the hand made nature of our product, no two sets same tha same, just like real teeth.